The global vitamin ingredients market is highly consolidated and competitive, according to Transparency Market Research. The five leading players in this market for 2015 were BASF, DuPont, Koninklijke, Amway, and Lonza. They collectively held close to 70% of the global vitamin ingredients market in 2015 and the TMR report states that this scenario is not likely to change over the next few years. Meanwhile, the competition could intensify further due to the high number of mergers, acquisitions, and partnerships being formed in the market. As per the report, the global vitamin ingredients market was valued at US$5.3 bn in 2016. The market is projected to expand at a CAGR of 4.90% within a forecast period from 2017 to 2025 and is expected to reach US$8.1 bn by the end of 2025. In terms of volume, the global vitamin ingredients market is expected to reach 63,512.4 tons by the end of 2025. Pharmaceuticals has emerged as the key application segment in the global vitamin ingredients market and is likely to remain dominant over the coming years. Growing Prevalence of Nutritional Deficiencies to Boost Demand for Vitamin Ingredients“The growing concerns, along with the increasing awareness about maintaining health and fitness, have encouraged consumers to boost their overall intake of vitamins, consequently propelling the sales of vitamin ingredients globally,” states a TMR analyst. The global vitamin ingredients market is also being driven by the growing prevalence of nutrition-based deficiencies and chronic illnesses, including Alzheimer's disease, a key geriatric illness that is linked to vitamin D deficiency. The overall consumer focus has moved closer towards preventive healthcare. This, as a result, has propelled the overall intake of nutritive elements, which includes the global market for vitamin ingredients. The market is also propelled by the rise in awareness of consumers regarding the benefits that various vitamins provide, especially vitamin C.
Asia Pacific, the current regional lead in the global vitamin ingredients market, is expected to maintain its dominant position over the course of the report’s forecast period, thanks to the very high population density in this region, coupled with increasing concerns of consumers over health issues, and the growing number of people suffering from nutritive deficiencies in its emerging economies. Analysts evaluate the Asia Pacific vitamin ingredients market to expand at a CAGR of 5.40% from 2017 to 2025, a statistic attributed to the rising disposable income of the working-class consumers, advancements in healthcare infrastructure and expenditure, and the availability of massive online and offline distribution networks. North America stood second in the global vitamin ingredients market for 2016. The region is likely to show a very healthy rate of growth in consumption of vitamin ingredients. A growing demographic of North American consumers is beginning to prefer preventive healthcare measures, thus fuelling the demand for vitamin-based food and drugs. This trend is expected to remain strong over the coming years, leading to a considerable progress for manufacturers and distributors of vitamin ingredients within North America. 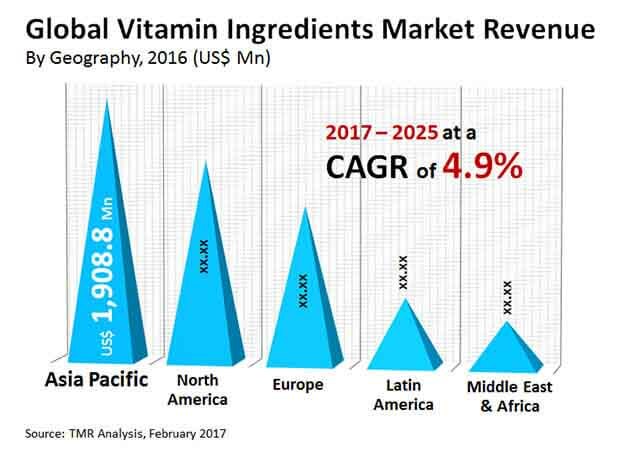 The global vitamin ingredients market is, however, being restrained by factors such as the increasing preference of consumers for direct consumption of natural vitamin sources, such as fruits and nuts, threatening to limit the progress made by the global vitamin ingredients market to some extent in the near future.